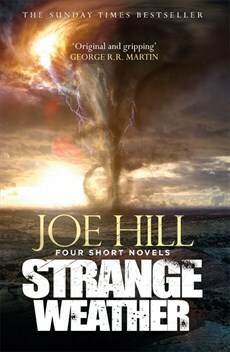 This week my teaser comes from Strange Weather by Joe Hill which I received from NetGalley. It’s a collection of four novellas (each around 100-150pgs) written at different points in Hill’s career each with some kind of weather link. I enjoyed some a little more than others (Aloft was my favorite) but all are brilliant. My teaser is from the first story Snapshot about a Polaroid camera that erases memories with each picture it takes. I love photography and this book sounds like a doozy. It is very well done. My first book by the author but won’t be the last. I’m a bit hit or miss with short stories but these are just the right length. Really enjoyed them. They can be hit and miss I think. I’ve just read a collection that were either great or grrr. Sounds intriguing. I don’t read horror and have never read this author though. This week my book is A Peace Divided by Tanya Huff. Happy reading! I found it more bleurgh than scary and even then not too bad. Loaded in particular is possibly more thriller than horror. Yes, I keep seeing it popping up. Not sure if it’s for me though. A couple of the stories are quite sci fi including my fave Aloft. Maybe one to pick up if you spy it in the library.